In short, I had never run (or done anything athletic) until I was well into my 30s. Then I watched ‘Run Fat Boy Run’ (with Simon Pegg) and decided to sign up for my first race. That was in 2009, and I’ve never looked back! I’ve run with Forerunners for many years, benefitting from the wisdom of Coach Carey, and making some great friends. But I’m a social runner, so I also run with the West Van Run Crew, and with RunVan on Thursday mornings. When I need to decompress, though, I also run solo. Running helps me get rid of stress, it’s given me the chance to travel, and I’ve met some amazing and inspiring people along the way! Debra Kato – one of my running buddies. The West Van Run Crew won last year’s team challenge, so I figured I had to join in again. That and the baked goods at the Summerfast finish line! I work in recruitment, so I spend a lot of time at a desk on the phone. Many of my coworkers run, so that keeps me moving – and running helps balance out the sitting all day! Running isn’t about how fast or fit you are – it’s about building strength of character. But it helps improve your fitness level, too! • Social media channels for others to share in your running journey. 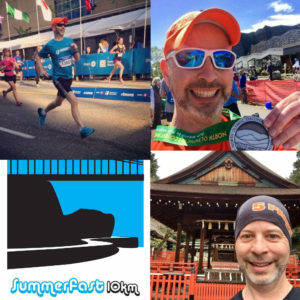 I blog at bradleyontherun.com – also Twitter (@bjcjapan), Instagram (@bradleyontherun), Facebook (Bradley on the Run) – and Strava (Bradley on the Run).